This novel was written in 1903 and was one of the first adventure/espionage novels that had a patriotic purpose. Written to show real conditions, geographic places and actual possibilities, and based off the author’s own sailing around the Frisian Islands of northern Germany, the story is an alarm to the British people about a possible pending German invasion in the years before WWI. The plot was slow to get going, but engaging despite its speed because of good writing and a well developed character in Carruthers, a young, just-out-of-college minor official in the British Foreign Office. He is delayed by loathsome work tasks from leaving London on holiday with all his friends, and has a bit of a fit over this grand injustice. In a stroke of providence, he receives an invitation from an old college acquaintance to come to the Baltic Sea for some off-season yachting and duck-shooting. Davies, the quirky, driven and skilled yachtsman, brings Carruthers into his world, which isn’t all it seems. A game of espionage soon unfolds as the pair poke around the shallow sands and muddy inlets along the backside of Germany’s Frisian Islands. There they encounter a handful of characters who may or may not be who they seem to be. While billed as one of the first of its genre, is definitely not a fast-paced action novel. It is a slow, technical, descriptive, dialogue-rich description of events. Pages-long expositions on how a shallow draft vessel must poke carefully through hidden channels and work the tidal motions to its profit will bore the one looking for a thrill. But I enjoyed the challenges of sticking to the book, learned something about sailing, and enjoyed being engulfed in a world so foreign to me. But once the plot began to develop, it was a bit easier to enjoy. The last many chapters are quick-paced and fun to read, filled with suspense and daring close calls. I say again, however, the rest of the book is filled with sailing jargon and geography, knots and lines, kedging and tidal movements, mud flats and rough levies. Four maps and sea charts are provided, and each was called out by the author multiple times. That’s fascinating stuff if you sail, but not always the most inspiring prose if you are a land-lubber like me. Thankfully, we have vast sand flats and tidal hazards near by, so many of the descriptions made sense to me, I’ve see boats grounded on hidden shoals and have probed for the channel in tidal creeks myself. I enjoyed the rich descriptions as much as I could, especially the interior of the delightful lifeboat converted to a yacht, the wonderful Dulcibella. I enjoyed her various equipment, appointments, stores, meals and messiness. She seemed as much a character as the two men sailing her. I enjoyed those men, Carruthers and Davies were certainly well developed. There was a beautiful transformation of Carruthers in the early pages of the book. The reader witnesses his change from a proper, uppity, higher-class British up-and-coming government man to a basic man of essential grit, classless and unprejudiced. Davies, his college friend, served as a great transforming catalyst for Carruthers, it was a nice commentary on the class concept in post-Victorian England. I enjoyed some brilliant writing skill and expanded my vocabulary quite a bit. But it must remain as a three and a half star book on my shelf. It is to be remembered fondly, with a smile, but a star has been knocked off as a warning to others – know what you are embarking upon if you wish to read this yarn. It is adventure indeed, reading this novel is worthy of the effort it requires. And before I finish, I must give a big, fat grade of ‘F’ to the cover designer of this edition. I am a great fan of the Penguin Classics – I love the book format, the black title field, the orange and white typography, the font choices and the iconic white stripe. I usually love the image that is chosen for the book cover – often they are compositions designed specifically for the story (See Graham Greene’s Our Man in Havana for a great example of a Penguin Classics edition with a thoughtful composition.) On this book, it looks like a design school drop-out’s last project (I went to design school, after all). I imagine the book cover fell through the scheduling cracks in Penguin’s design department, and some poor assistant had to scrounge up a Friday afternoon design before leaving for the weekend. I sympathize. But some creative director gave a thumbs-up to a German heraldic eagle turned sideways? And a crude black and white half-tone of a schooner that doesn’t remotely resemble the Dulcibella? Its ugly, poorly composed and an eye-sore. If the looks of a book contribute to your enjoyment of reading, this one will surely be a let down. I had high hopes for this novel. I enjoyed it, but with the same caveats that other reviewers have mentioned. It is interesting to note the colorful life of the author as well. 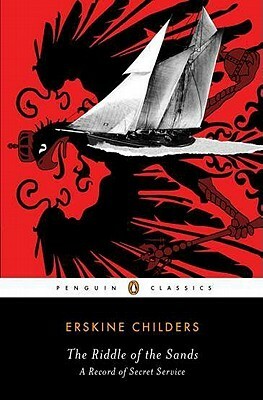 This book was based upon his own experiences poking around in a yacht. He was fiercely patriotic and imperial-minded, and this book actually did inform British naval policy. Churchill himself credited Childers’ book for the placement of certain naval bases. Churchill would also disavow Childers in later years as a Irish-nationalist rogue, for Childers had a change of heart. He supported the Irish nationalist movement, even smuggled weapons in his yacht. Childers worked with the Irish delegation to hammer out the Anglo-Irish Treaty with the British government, but was very displeased with the result. Ireland descended into civil war. Childers eventually became a man on the run, hunted by England and Ireland alike, and was executed by firing squad on November 24, 1922 for carrying a pistol. He was a colorful character indeed, and his son, Erskine Hamilton Childers (who was only 16 at the time of Childer’s execution), served as the fourth President of Ireland from 1973 until his death in 1974.